Keynote Openers — Need to energize your event's opening and set the tone? Luncheon Keynotes — or Right-After-Lunch Boosters — When your agenda needs some comic relief! Keynote Closing — Send your attendees home invigorated and inspired! When your organization needs to polish-up internal and external communication ... or boost morale …. to get attention and achieve more business success… bring in Sheryl Roush for customized, high-content programs with a motivational tone. Participants are educated, engaged and energized -- for lasting results! When your team needs to increase productivity, foster more team spirit and personal pride, improve customer service; generate business and client loyalty, you need programs and coaching that Sparkle Presentations has to offer! Known for highly-tailored, "how-to" presentations, Sheryl gets "inside" your organization to understand the greatest challenges and help you find real solutions. Clients range from associations, biotech, direct sales, education, finance, government, healthcare, hospitality and tourism, insurance and lawyers and law enforcement, manufacturing, military, real estate, retail, small business, technology, transportation, and women in business. Her 35 years of diverse experience and expertise blends skills for communicating: in person (interpersonal, teams, leadership, interviewing) in public (speaking, training, sales presentations, media interviews, social media), and in print (sales and marketing, graphic design and advertising). Clients bring Sheryl on-site to address staff in their workplace, as well as to speak at association meetings, as the conference keynote speaker and breakout sessions, seminars, emcee kick-off events, launch fundraisers and to facilitate 1/2 day to 3 day retreats. Programs are designed to have a lasting positive impact — and tailored to meet your objectives and exceed your expectations. Order AUTOGRAPHED copies directly from the author, from the SPARKLE STORE. An inspirational collection of true short stories, tributes and heartfelt messages by, for, and about members of Toastmasters International. All original and true short stories, poems, and tributes from military personnel, their families and loved ones. An inspirational collection celebrating working women and their unique contributions to the global workplace. "As a child, my Aunt Della was like a mother to me who nourished me with her chocolate chip cookies. I remember the warm feelings when I smelled a batch of her fresh baked cookies. 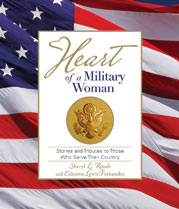 In Heart of A Mother, Sheryl Roush and her contributors have captured those same kinds of feelings, feelings that will warm your heart and bring your ‘mother’ close again. It's a great read." "Celebrating holidays gives us an opportunity to pause from daily to-do’s and survival to find greater meaning and significance in our life." Click here to print Sheryl's one-sheet speaker's brochure. Request a FREE Audio CD, CD-Rom, or DVD preview! "Sheryl, you have a special talent for engaging the audience in an inclusive and relaxing way. I've rarely seen a presenter connect with an audience in such a short time. It was quite impressive to witness! I also appreciate the way in which you were able to tailor the presentation based on the specific needs and requests you received from us in advance."